This year was my third (fourth?) winter sowing season, and the first and only time I've ever lost seedlings. 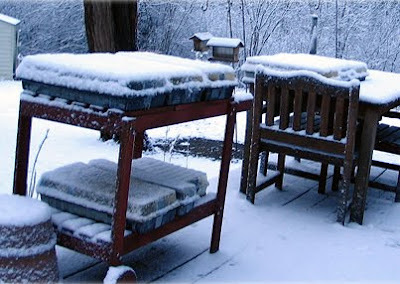 Temperature fluctuations are normal in winter in Michigan and are not a big threat to winter seed sowing. The seeds will only sprout after longer, warmer temperatures, each seed on its own natural schedule. A few days of unseasonably warm temperatures, say in February, won't trick a seed into sprouting only to be decimated through the rest of winter when temperatures sink back to frigid. It was mild back in late December when I set out my first tray flats. Here condensation levels are perfect for a newly sown, set-out tray on December 23, 2006. A month later, things had gotten cold and snowy. That's no problem at all, because the seeds are happily dormant in their long winter's nap. The same tray on January 24, 2007, is okey dokey! By mid March, I had sown a few more flats. The snow had melted temporarily, but it was still cold. Yep. It was all good on March 12. Three days later, on March 15, it had snowed again and I had set out more flats. Yep. Everything on track. Snow, melting, snow. Yep, that's Michigan. Yawn. 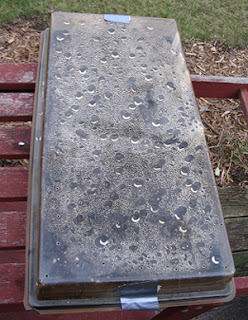 Another three days later, on March 18, the snow was gone again, but it was still cold and the lids of the seed trays had cool frost patterns. 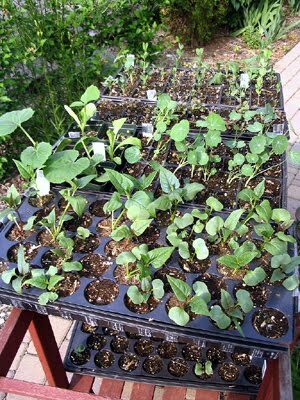 By early April, it had gotten fairly warm for many days in a row and a few eager seedlings pushed their heads above the soil. Hooray! Welcome, harbingers of spring. (There was much rejoicing.) 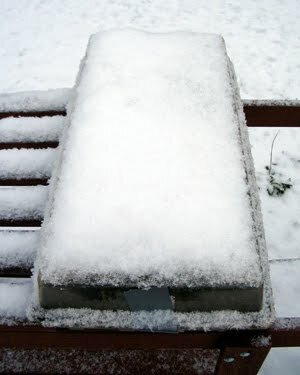 On April 6, temps dropped and it snowed again. Not a big deal. 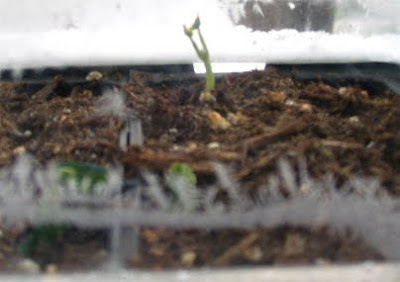 Sprouted seedlings, protected in their dome, can handle a few days of frost. Look, aren't they cute there in the frosted little greenhouse? Only it stayed well below freezing for many days, enough that for the first time ever, I lost many of my seedlings (peas, beans, moon flowers, and morning glories in particular). I didn't have the heart to photograph their collapsed little corpses. Now, I probably would have been able to save the seedlings by bringing them into my shed (or a garage, if I had one). Frankly, it probably would have helped just to move them under my deck or under the patio table. (Taking them indoors where it would have been way too tropical in comparison would have been just as bad. Don't try that at home!) 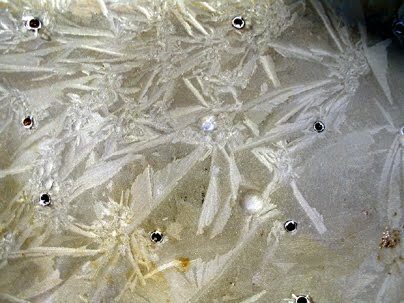 But I truly had so much faith in the process, it never actually occurred to me they might actually die, and I wasn't entirely aware of how many frost days we ended up having. I'm sharing this loss not as a way to discourage anyone from winter seed sowing, but to contrast how well it actually DOES work under normal fluctuations. 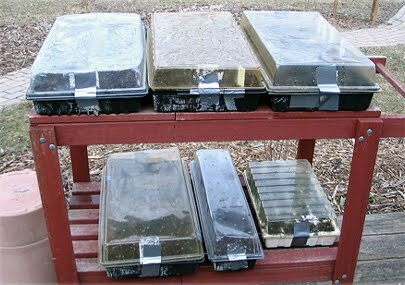 The lesson I carry with me is to move seedlings to a more sheltered, but still cold, location after, say, two days of extreme cold following a really long period of extreme warmth.